The EET uses auditory, visual, and tactile information to help students/clients organize information for speaking and writing. Oral language helps organize thinking and focus ideas. It is a precursor for writing. Students can use the EET for oral language and then transfer it into writing. The EET is a strategy that can be used year after year across the curriculum. It can be used for assignments, tests, reports, and more. The EET provides language enriched experiences that facilitate improved descriptions, definitions, comprehension of curriculum items, ability to organize information, and provide more details. The EET focuses on semantic language areas. Semantics has to do with the meaning of words, phrases and sentences. The EET is quick and can be incorporated into what teachers/speech therapists are already doing in the classroom. Lecture produces the smallest degree of retention for most. Move away from lecture by using the EET for classroom discussion, small group activities, learning games, demonstrations, and hands-on activities. I would like to thank the hundreds of educators who have contacted me with success stories, student before and after samples, and testimonials about the EET. I would especially like to thank Mary Jo DeWeerd and Susan McCann from Hudsonville Christian School, Dawn States from Faith Lutheran School, and Elana Waugh from White Pine Academy for sharing the research and data pertaining to the EET for this section. Thank you for your help and knowledge. It’s a wonderful feeling to come across such enthusiastic and devoted educators. Thanks and I wish your students continued success! The x-axis represents the 16 students in the preschool class. 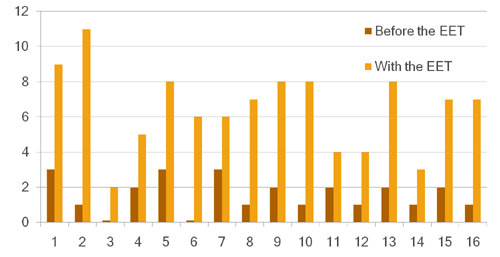 The y-axis represents the number of details the preschoolers included when describing items both before being introduced to the EET (darker line) and after using the EET (lighter line). Every student in the class increased the amount of details when using the EET. White Pine Academy in Leslie is in its second full year of using the Expanding Expression (EET) Writing Program, and it has proved to be a success according to the schools MEAP results in writing. The third grade improved from the 2007-2008 results by 7%, the fourth grade improved by 32% going from 18% in 2007 to 50% in 2008, and the fifth grade improved by 22% going from 26% in 2007 to 48% in 2008. “The EET writing program is amazing. 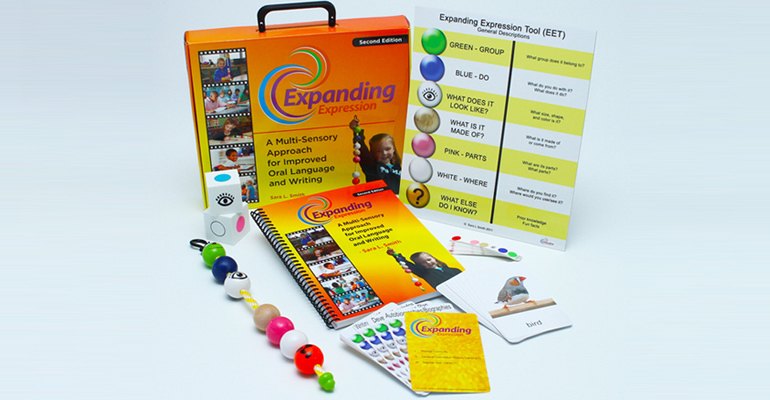 It gives the students a multi-sensory tool that targets both oral and written expression. I have seen huge improvements in the quality of my students’ writing,” says Elana Waugh, fourth grade teacher and facilitator of the program at White Pine Academy. The EET program was created by Sara Smith, a Speech and Language Pathologist from Bay City. For more information about the program, visit www.expandingexpression.com or contact Elana Waugh at White Pine Academy.